Today’s Project Gutenberg eBook release, courtesy of Distributed Proofreaders and our Digital Library, is Custer’s Last Shot; or, The Boy Trailer of the Little Horn by Col. J. M. Travers (actually a pseudonym of St. George Rathborne). 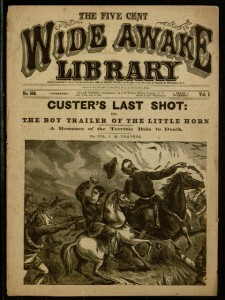 While the eBook edition is based on the Wide Awake Library reprint from 1883, the story was first serialized in Boys of New York starting on August 7, 1876, less than two months after the Battle of the Little Bighorn depicted in the tale, demonstrating just how quickly publishers were willing to exploit news of the day for sensational fiction. Custer’s Last Shot weaves the story of the battle with that of a criminal conspiracy, and while historical figures are given a prominent role, the main protagonists are Pandy Ellis and Bolly Wherrit, aged but hard-fighting and apparently indestructible rangers (who also figure in other Rathborne tales), and the titular “Boy Trailer,” who seeks to rescue his kidnapped sister from a series of abductors. Similar comments have been made by later authors for different reasons. While it would certainly have been interesting to find a dime novel of this nature expressing some sympathy toward Native Americans, that is not the case here; Rathborne (whose portrayal of “Indians” is uniformly demeaning) is instead suggesting that the word “massacre” is insulting to the fallen soldiers. Nonetheless, it is interesting to see the author attempting to stimulate the critical thinking of his action-hungry, juvenile audience. This is not the only surprise to be found in the hastily-written and disposable, yet historically interesting, text. If you wish to discover more, the entire novel can be read online (or downloaded in eBook format) through Project Gutenberg.